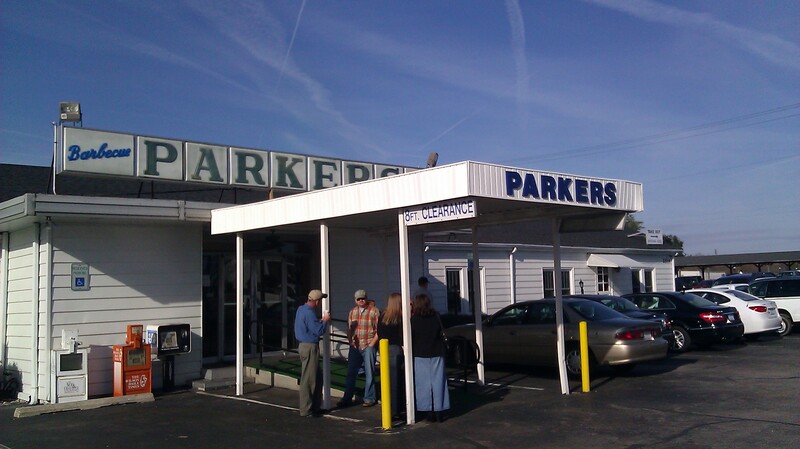 (The Original) Parker’s Barbecue in Wilson used to just be known as Parker’s Barbecue, and to most people it still is. But a restaurant named Parker’s Barbecue in nearby Greenville, started by relatives of the founders of Parker’s in Wilson–who had sold to non-Parker family owners in the 1980s–gave (The Original) Parker’s reason to want to differentiate itself. Hence the parentheses, and the confusing lineage. But (The Original) Parker’s food is the opposite of parenthetical and far from confusing–it is straightforward, honest to goodness classic Eastern North Carolina barbecue… with one major caveat: they no longer cook on wood-fired pits. 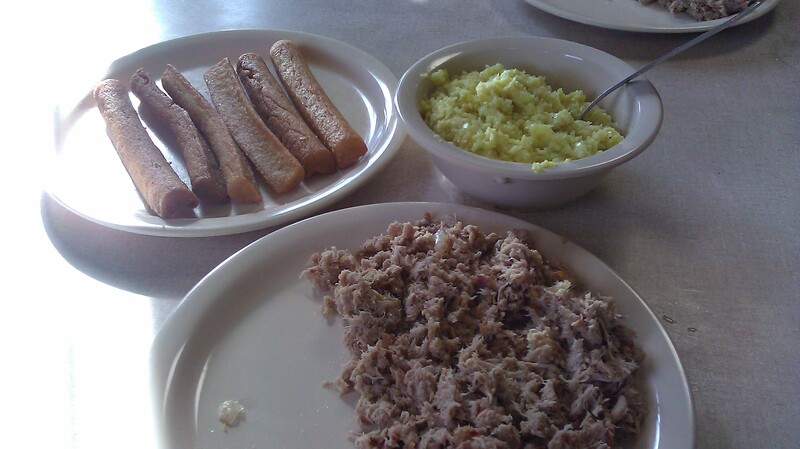 There are two famous barbecue joints in Wilson. One of them is as close to an amusement park as an old fashioned NC barbecue joint gets. The other one is (The Original) Parker’s. From the simple wide white ranch style building that has housed the restaurant in its current location since its founding in 1946 to the food to the waitstaff, Parker’s is all business. The waitstaff is entirely male–hard working, always hustling, white apron- and white paper hat-wearing young white males. The decor is sparse and simple–real wood paneling, tables lined up one after another, a few aging newspaper articles about the joint on the wall, etc. Between the decor and the waitstaff, when you walk in the front door at Parker’s it’s easy to think you have entered a time warp back to the 1950s. A basic menu and stark–even by BBQ joint standards–presentation of the food does nothing to make you think you’ve reentered the 21st century. But why bother to live in 2011 when the barbecue was so good a half century ago? Parker’s delivers on what it silently promises–good, straightforward Eastern-style barbecue and sides. In my opinion, Parker’s whole hog, wood-cooked barbecue is not as jaw droppingly succulent as places like Grady’s and the Skylight Inn. Parker’s pork is quintessential Eastern-style ‘cue: chopped fine, tender, lightly sauced and leaning toward the dry side due to the large amount of leaner meat from the hams. It includes flecks of skin, though Parker’s is “cleaner” than places like those mentioned above. I personally think Parker’s is a bit too dry and clean, and machine-chopped too finely, but it’s good ‘cue and seems pointless to criticize a place like Parker’s that delivers exactly the type of high quality barbecue it sets out to deliver. (Well, except that they dropped cooking over wood pits in recent years, which is a major affront to history and tradition, and deserves criticism in my fundamentalist BBQ holy book.) To counter the dryness, I added quite a bit of the straight-ahead simple vinegar/hot pepper sauce (picture Texas Pete cut with a little more vinegar and your right on). Another strategy is to mix the pork with the terrific, slightly mustardy but sweet yellow slaw. The slaw matches the pork perfectly. 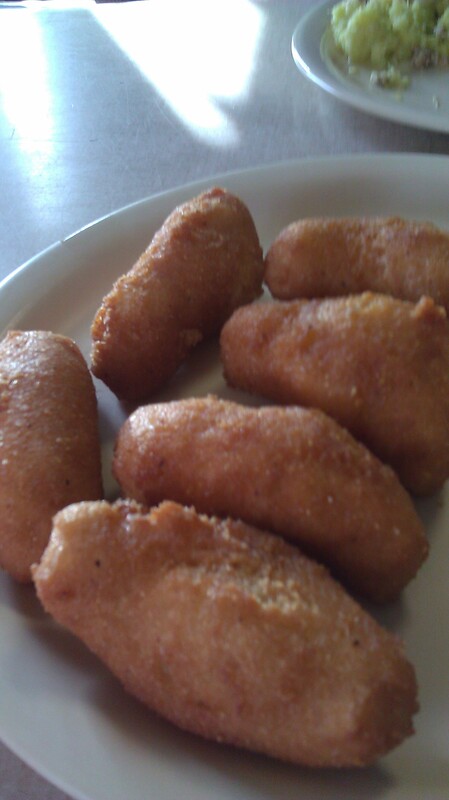 You’ll also be pleased by the plump, sweet hush puppies and dense, classic cornsticks. If you want to upgrade from the “barbecue plate” of pork, puppies/cornsticks and slaw to the “barbecue dinner”, you’ll get to add a few selections from among a small group of traditional Eastern-style sides: barbecue boiled potatoes, string beans, Brunswick stew and french fries. If you order a combination dinner, you can sample Parker’s highly regarded fried chicken. Or for a couple of bucks more you can order “family style” and get all you can eat ‘cue and sides, plus a couple of pieces of chicken. Barbecue chicken, fried shrimp, chicken livers and a few other dishes plus desserts round out the menu.